According to St Matthew’s Gospel, after hearing from the wise men of the birth of Jesus, King Herod ordered that all children in Bethlehem under the age of two should be murdered. Bruegel set the story as a contemporary Flemish atrocity so that the soldiers wear the distinctive clothing of the Spanish army and their German mercenaries. The artist also drew upon his experience of the exceptionally severe winter of 1564-5 to describe a village covered in snow, with icicles hanging from the rooftops and the pond in the foreground thickly frozen over. 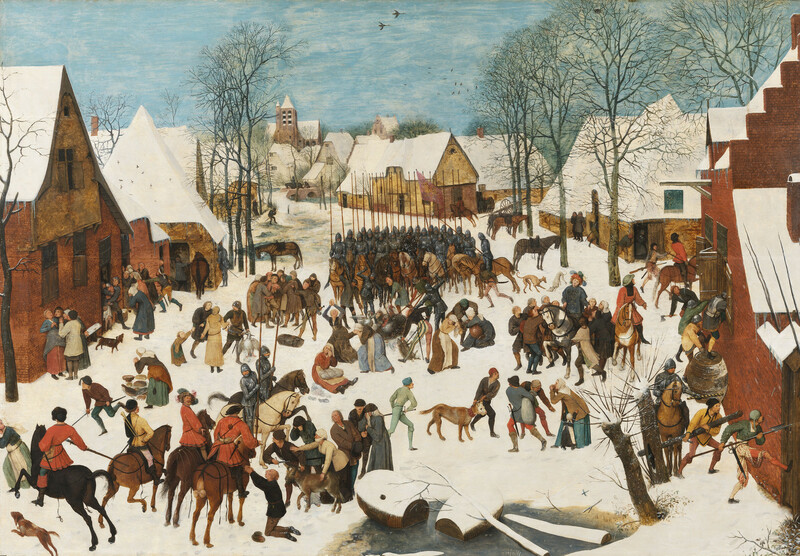 Bruegel’s Massacre of the Innocents was a popular image, repeated numerous times mainly by the artist and by his son, Pieter Brueghel the Younger. Shortly after its creation the painting came into the possession of the Holy Roman Emperor, Rudolph II, in Prague. The slaughtered babies were painted over with details such as bundles, food and animals so that, instead of a massacre, it appeared to be a more general scene of plunder. The biographer, Karel van Mander, described it as a 'Massacre' in 1604; it had become a ‘village plundering’ when recorded in an inventory of 1621. The shadow of the infants can be seen underneath the over-painted areas. The flames added in the sky over the houses were cleaned off in 1941, but it was decided during its full conservation treatment in 1988 to leave the more substantial (and historically significant) alterations to the figures, where animals and inanimate objects are painted over the details of children being slaughtered. The painting is a unique example of multiple narrative. Bruegel’s painting requires us to read each episodes one by one. In the background, immediately below the church, a father tries to smuggle his baby to safety, though the mounted soldier on the bridge behind and the many horses tethered (their riders presumably searching houses) suggest that he is unlikely to succeed. In the left background a soldier urinates against a wall. A soldier herds women into a house at the extreme left; another soldier carries a baby (one of the few that have not been changed) out of a nearer door, while against the wall of the same house some neighbours seem to be consoling a grieving mother. Moving to the right, a standing woman grieves over her dead baby lying in the snow (changed to an array of hams and cheeses); a couple seem to beg a soldier to take their daughter rather than kill their baby son (changed to a goose or swan); a huddle of villagers console or restrain a father who might otherwise attack the Lansquenet (German mercenary) in striped hose who guards a dead baby (changed to a bundle). A seated woman grieves with her dead baby (changed to a bundle) on her lap. A group of soldiers stab with pikes at a pile of babies (changed to livestock) to ensure that they are all dead; women run off in horror as another Lansquenet stabs a baby (changed to a young boar); a soldier stabs at a baby (changed to a pitcher) cradled by a seated woman. At this point a distinct group forms as ugly and ridiculous-looking villagers remonstrate with a young, elegantly-dressed herald who originally had the symbol of the Habsburg eagle on his tabard (overpainted with a simple decoration). At the extreme right soldiers are forcing entry to an inn: one wields an axe and one a battering ram, three climb in at the shutters, one kicks down a courtyard door, thereby dislodging an icicle that will fall on his head like divine vengeance. Reading across the foreground right to left we see a baby (changed to a bundle) torn from a mother and her daughter. Two generations of a family grieve for a baby about to be stabbed (changed to a calf). At the left foreground another sergeant pursues a fleeing mother and child, a group not painted over though partly lost when this side of the panel was cut down at some point in the painting's history. The troop of armoured knights is led by a man, whose features have been altered. In the other versions of this painting he has the distinctive drooping eyes and long beard of the Duke of Alva, who harshly ruled the Netherlands for Philip II of Spain from 1567-73. Before it was painted over, the standard held by one of these soldiers displayed five gold crosses on a white ground - the arms of Jerusalem, which were sometimes used as an emblem of Philip II of Spain.